Need Engine repairs Autoking can do it right the first time. Ask About our expert transmission services . All of our service technicians are ASE and ASA certified. Feel confident that your repair will be done right the first time! We provide complete diagnostics, scheduled maintenance, and repair on all automotive makes and models. We are a full service maintenance and repair facility specializing in both Foreign and Domestic Cars, Trucks, Vans and SUV's. Our staff has a combined 30+ years of experience in auto maintenance and repair. Our certified technicians provide the highest quality service at one of the lowest prices around. We pride ourselves on going the extra mile for our customers. 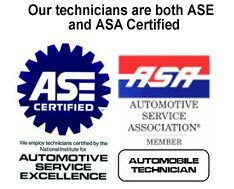 All our technicians are ASE and ASA certified and have over 30+ years of experience in auto maintenance and repair. Contact us today for your free estimate! Autoking is proudly partnered with Hannah's Towing service. Hannah's is available 24/7 for all your towing needs and will bring your car straight to our shop for any necessary repairs. Drop off your auto at any time 24/7. If it's outside business hours, just drop your keys through the key drop at the front door. Don't forget to lock the doors on your car! Auto repair financing options available with up to 90 days deferred interest payments. Stop in or give us a call for more details. Regular maintenance is a vital part of keeping your car running its best and avoiding costly repairs. Doing regular maintenance such as oil changes, air filter, hose and brake inspections can save you thousands of dollars in the long run. Our technicians are trained to catch problems before they start! A simple inspection each time you bring your car in for a scheduled oil change in most cases is all that is needed to keep your car running and avoiding costly repairs. Schedule your next appointment for service or maintenance.